The Rental & Staging Forum panel included (left to right): Tom Alford, general manager, Alford Media Services; Steve Bury, vice president of sales, AVW-TELAV Canada; Josh Weisberg, president, Scharff-Weisberg Inc.; Jeff Studley, president, CPR MultiMedia Solutions; Wayne Vincent, senior director of operations, MVP International; and Ken Sanders, EVP, Video Equipment Rentals. The good-looking moderator is Tom Stimson. Most rental and staging companies derive their business from large corporations. This does not necessarily mean that their direct customers are all big businesses. More times than not, there is a company or individual positioned between the stager and the end customer. That meeting planner or event producer derives their income by adding value to the services of other vendors including AV rental and staging companies. Even if the AV provider and the producer are hired separately, there is a potential conflict if both parties are attempting to improve their value proposition with the same services. The moral of the story is: dont compete with your customer. The question to be answered is Who is your customer? 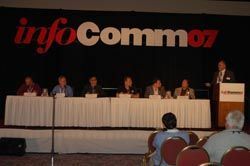 At the 2007 InfoComm Rental & Staging Forum, six industry experts shared their thoughts on this and other topics (see the photo caption to find out whos who). The Forum touched on a number of issues and again used an Audience Response System to first poll the attendees before hearing the panelists thoughts. This year Video Equipment Rentals donated a Turning Point ARS system and provided every attendee and panelist with a response transmitter. To get things going we asked how companies recruit new employees. Half the respondents indicated that web job boards and print classifieds are their primary method of recruiting entry-level employees. To recruit experienced folks, two-thirds say they rely on referrals or word of mouth. The panel was quick to point out that keeping employees was as important as finding them. When it comes to attracting and retaining employees, over 75 percent of the audience say their firms have either a 401K or a profit-sharing plan. The Forum audience is probably not representative of the whole AV rental industry, but this is an important metric to remember. As more AV companies consolidate, it will become even more difficult for smaller companies with no retirement benefits to compete for the best workers. Have you ever had a potential customer provide your technical solution to another vendor just so the competitor could do the job? A discussion on intellectual property rights as they pertain to customized staging proposals revealed some confusion and a surprising level of duplicity. Half of the audience recognized that three proffered definitions of intellectual property where, in fact, all correct. Three quarters of the audience felt it was unfair for a customer to show one companys proposal to a competitor, but 94 percent admitted having seen a competitors proposal. An informal show of hands indicated that most companies do not have intellectual property retention clauses in their proposals. Even those who do said they wouldnt enforce such a clause even if they felt it had been violated. In the end, most panelists and the audience said that the customer owned the proposal once it has been delivered to them. The final topic of the day was reserved for the panelists only. The question was What trends do you see in production services offered by rental and staging firms? Production companies have found it more difficult in recent years to differentiate their creative services to corporate clients especially for smaller events. With advances in technology, production tools are accessible to anyone with a computer. Corporations often manage their own speech support content, and meeting themes often come direct from their marketing departments. Most panelists cited an increased demand for services they once considered production-only. Not surprisingly, the pure-play stagers on the panel are more sensitive to stepping on the toes of their customer base. They pull up short of producing videos or creating meeting themes. On the other hand, AV companies that specialize in hotel and convention services seem to be gathering production resources with the intent of marketing to the end customer. While no one was admitting it at the Forum, several major AV rental companies have placed producers on their staffs and some have even gone so far as to form production departments. One thing that the panel and probably the industry can agree upon: there will always be a segment of the events business that will require the services of dedicated production companies. And as long as there are producers with business, there will be stagers who will cater to their needs. Is the Tipping Point for HD Projection just around the corner? In February 2009, television stations in the U.S. will be switching off their analog transmitters and broadcasting solely in digital HDTV. This long-awaited development will probably come and go before HD video projection completely permeates the AV rental industry. The reasons are simple: HD projection chips are still pricey and consumer demand just hasnt materialized yet. This situation is slowly changing as single-chip DLP projectors improve in quality and drop in price. True 1080i HDTV large-venue projection has until recently been limited to the even more expensive 2K chip, but new, more affordable HD (1080) chips have been arriving in projectors starting in the 8000-lumen range. In The Stimson Groups January 2007 Purchasing Managers Survey on equipment buying plans, 25 percent of respondents total capital budgets were earmarked for video projection, and one-third of all companies planned to invest in DLP projection in both conference and large-venue categories. Fast forward to InfoComm 07 and the Rental & Staging Forum. In an informal poll of the audience, one-third claimed to have in their rental inventory a large-venue HDTV-native video projector. But more than half the Forum attendees indicated that their customers have little or no use for HD content as of yet. The Rental & Staging Forum panelists on the other hand, see demand for HDTV growing in their customers. Given the success of the panelists respective firms, maybe the rest of us need to figure out what they know?Each month The Stimson Group conducts a short survey of AV industry professionals about a variety of topics. To participate in or comment on those surveys, email: surveys@trstimson.com.